E-bikes are all the rage. However, their drives have often been optimized more with regard to costs and less with regard to best possible power delivery. Compared to other electrically powered vehicles, pedelecs therefore often perform poorly in terms of efficiency and range. 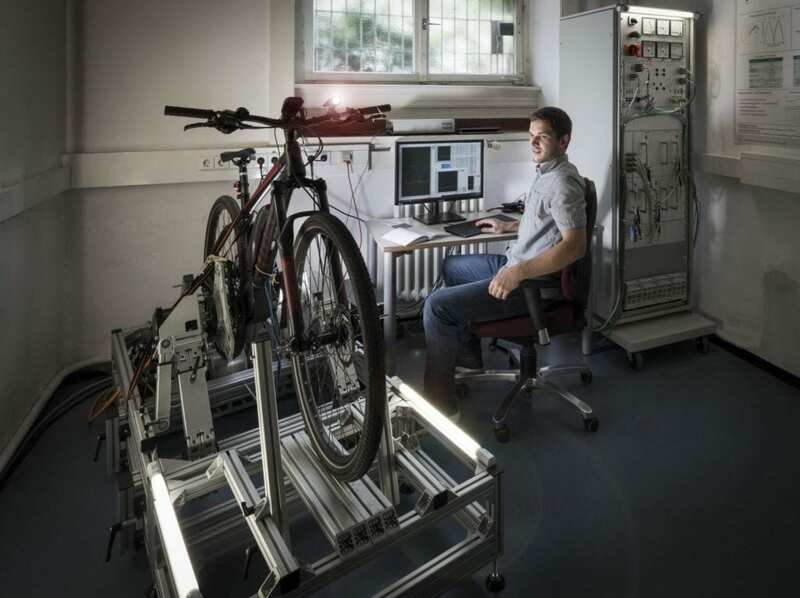 Researchers at Karlsruhe Institute of Technology (KIT) now want to improve e-bikes and have set up a special test bench for it. “Most motors that are now installed in e-bikes were originally developed as drives for other small electrical devices, for example for power steering in cars,” says Martin Doppelbauer from the Institute of Electrical Engineering (ETI) at KIT. That’s why they are not bad per se, but have also not really been optimized for providing the best performance, according to the Professor for Hybrid Electric Vehicles. An average electric car currently has an efficiency of 90 percent. So the energy supplied is converted almost completely into output. “In conventional pedelecs, on the other hand, it’s only 70 percent,” says Doppelbauer. Future motors need to be particularly more compact, and therefore smaller and lighter with a greater range. To achieve this, researchers at ETI are using development methods and findings from larger drives for battery electric vehicles that are already highly developed and applying them to small pedelec motors. To put the new developments through their paces, the ETI researchers have set up a new test bench which is commonly used in the automotive industry. “Here we can perform fully automatic and realistic endurance tests on bikes,” explains Doppelbauer. The bikes will go through different cycles at all speeds, and ascents and descents can also be simulated, the way it is also done in large motors.